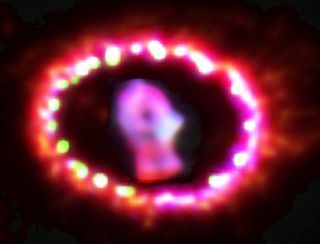 The debris of Supernova 1987A is beginning to impact the surrounding ring, creating powerful shock waves that generate X-rays observed with NASA's Chandra X-ray Observatory. Those X-rays are illuminating the supernova debris and shock heating is making it glow in visible light. The most powerful star explosions in the universe can blast out far more freshly made radioactive titanium than has been suspected: up to 100 times the mass of the Earth, researchers say. These new findings about this radioactive titanium production promise to shed light on the mysterious inner workings of these stellar outbursts and on how the elements that help make up everything from planets to people are generated. The most powerful star explosions are supernovas, which are bright enough to briefly outshine their entire galaxies. The mind-boggling heat and force of these outbursts help forge the heavier elements, a process known as explosive nucleosynthesis. Much remains uncertain about the extraordinarily complex processes that occur during supernovas. Astrophysicists often hope to learn more about them by analyzing the aftermaths of these explosions. For their new study, scientists investigated the remnantsof a supernova seen in 1987. The SN 1987A star explosion took place in the fringes of the Tarantula Nebula in the Large Magellanic Cloud, a nearby dwarf galaxy, about 168,000 light-years from Earth. The researchers focused on the radioactive isotope titanium-44 that SN 1987A generated. Computer models had suggested that "type II" supernovas such as SN1987A generated up to about 80 times as much titanium-44 as the mass of the Earth. Using the European Space Agency's INTEGRAL satellite telescope, the scientists looked for wavelengths of X-rays most likely generated by this particular isotope of titanium. The levels of radiation they detected helped reveal how much of the radioactive metal was there. "The amount of titanium-44 found corresponds to approximately 100 times the mass of the Earth," said study lead author Sergei Grebenev, an astrophysicist at the Space Research Institute of the Russian Academy of Sciences in Moscow. This vast amount of radioactive titanium is enough to power the emission of light from the supernova remnant over much of its lifetime. The findings could lead to better models of supernovas and the way they forge elements. "I am sure that our results will stimulate specialists in explosive nucleosynthesis to make new simulations and to study production of titanium-44 in more detail," Grebenev told SPACE.com. "It is of great importance for physics of supernovae and for the theory of element production in the universe." The scientists detail their findings in the Oct. 18 issue of the journal Nature.